I think this is going to be our first iteration look; any comments? We like the name UniDescription, because it connects to the history of the UniGrid brochures, which inspired this project, and it’s unusual (easy to get the domain names). It also offers us a mission within its name (to unite the world of audio description). The prefix of this name Uni can refer to many ideas at once; it links to the UniGrid brochures but also our attempts at uniting everyone in the world interested in audio description. Its foundations are in Universal Design (another UniD), and we hope to bring unity to this field, through our work, unifying researchers, practitioners, users, and supporters. I also think we could pronounce this project as the UniD (sounds like Unity) project. Brett Oppegaard presented the latest findings on our audio description research project at The Association of Computer Machinery’s annual conference for the Special Interest Group on the Design of Communication, this year held in Limerick, Ireland. The presentation focused on “Envisioning Mobile Apps for Audio Description: Exploring Universal Design of National Park Service Brochures” and covered several initial rounds of content analysis on National Park Service brochures, data which will help with the cross-modal translation of the brochures in later rounds of the research. 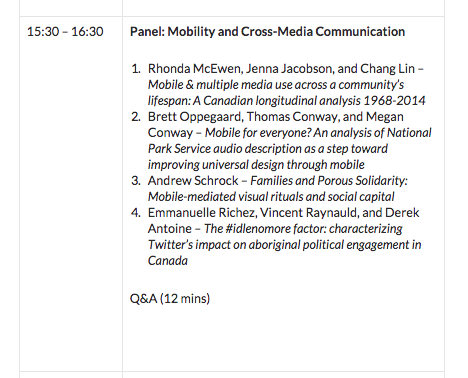 Brett Oppegaard presented (in representation of Megan Conway and Tom Conway) the paper “Mobile for everyone? 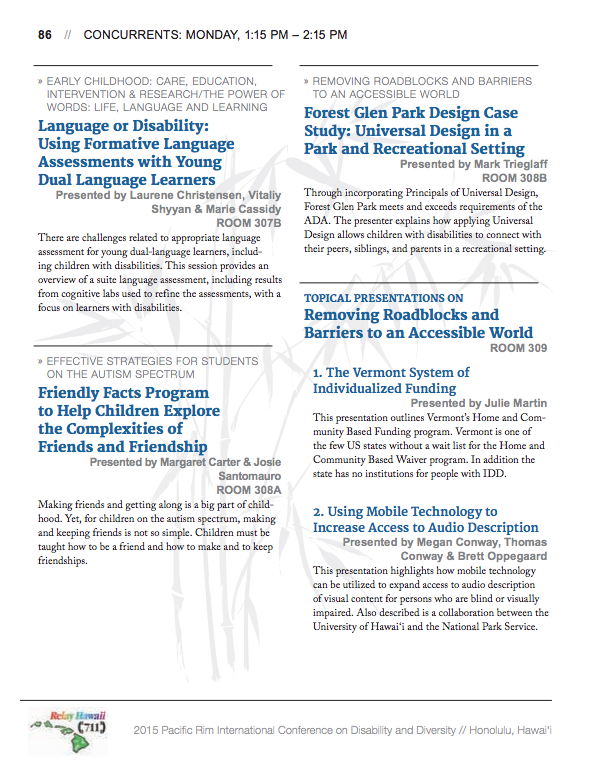 An analysis of National Park Service audio description as a step toward improving universal design through mobile” at the 2015 International Communication Association Mobile preconference in Puerto Rico on 5-20-15. Thomas Conway, Megan Conway, and I presented a talk about our audio description research methods at the PacRim International Conference on Disability and Diversity in Honolulu on 5-18-15. Researchers on campus plan to develop a web tool that will assist the blind and visually impaired at national parks thanks to a $278,300 National Park Service (NPS) grant. According to Oppegaard, who teaches in the campus School of Communications, the group’s goal is to be finished in 2017. Oppegaard said the project would be environmentally friendly, converting the traditional brochures to audio. The finished project will operate on park goers’ systems as mp3 files. The location for the test protocol will be determined in 2015. Oppegaard believes that visually-impaired people deserve the same as every other person at learning about the parks and that the audio would stem information to those who want to learn more. According to Thomas Conway, media coordinator and project director for the EmployAble Project of the Center on Disabilities Studies in the College of Education, the initial text for the speech program will be in English but it can also be translated into other languages. He added that the difference between the audio description and the straightforward translation is the description part. Conway said Braille, a method used for the blind by touch reading, would be an option that is based on the text translations. Since the project is the start of the pilot study, the researchers are concentrating on what the NPS (National Park Service) brochures currently offer. “A future project will be to offer more indepth information,” he said, describing an optional long version of the brochure that would explain more to those whom are interested. Conway, along with his wife, Megan Conway, assistant professor and a faculty member in the Disability and Diversity Studies Program, will be working on the upcoming NPS project along with Sean Zdenek, an associate professor for the Department of English at Texas Tech University, who teaches disability studies and rhetorical criticism. He added that people would be able to listen to the description in the car while experiencing the park. According to Oppegaard, some people listen better than reading and that the audio can also be enjoyed by everyone including people that have dyslexia.